Freedom from oppression is a common theme in mediaeval Scottish poetry, in relation to the War of Independence fought by Wallace and Bruce. 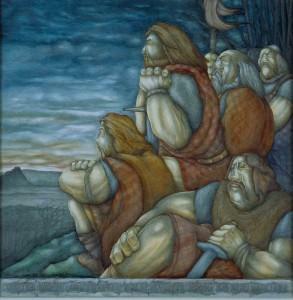 The work was painted for the Brave Art competition at the Smith in 1996, and purchased for the collections. It is presently on display in the Stirling Views exhibition, but is also significant for the Black History season in the Stirling Smith, where the issue of freedom is all important. The struggle for freedom has taken place on so many levels. The Scottish colliers, who were in a state of slavery in the 18th century looked to Wallace as their example, and the Sir William Wallace Grand Lodge of Free Colliers of Scotland still march the Braes of Falkirk, every year to this day, in honour of Wallace, Scotland’s liberator.